Being one of the fastest-growing and dominating brands in the hair world, Lace Xclusive was not only born out of the passion for providing our clients the best raw Unprocessed Virgin Hair Extensions and Wigs, but we are also committed to the empowerment of our customers. This we have further demonstrated with our new Distributor Program, a carefully designed system to enable customers to enjoy a physical connection with the products, the brand and the company at large. With quality and skillfully well-detailed packaging styles dedicated to Lace Xclusive current and future releases, you can be sure of getting the products of highest quality at an amazingly below-retail price. Distributors get to enjoy the same level of sophistication of products that are directly sold through our website when they join our Distributor Program. As an active member of this program, you stand a chance of earning up to $200,000 over a year. Perfect for Hairstylists, Salon Owners, Students as well as those looking to make an extra income. Lace Xclusive boasts of a strong network of committed followers in the U.S and globally and this will give you exponential increase in overall sales and invoice values per customer. The sales of other hair care products like high-end shampoo, conditioner and others will naturally increase as you get more sales for our products. With our unique consultation experience, your customers will feel closer to you and more at home, as they are allowed to see, touch and pick their perfect piece of Lace Xclusive Virgin hair. They will come back for more while bringing their friends along! Due to the limited number of distributors per city, you enjoy exclusive relationships and less competition. To give you a proper sales support and customers service, your contact information will be listed on our website, and you will be promoted on all our social media outlets. More fame, more customers, more sales! You also get a variety of customized promotional materials on request. These materials will be imprinted with your company's details and contact information. The first essential requirement to join our Authorized Distributor Program is Membership. Membership is only granted to any company or individual upon a proper review, through a process involving an overall understanding of its products or services, and how Lace Xclusive will create a robust connection with your targeted audience. The applying company must also be registered with the local office of the Secretary of States and must have a website and social media outlets, which shall be reviewed for correct use of our products. 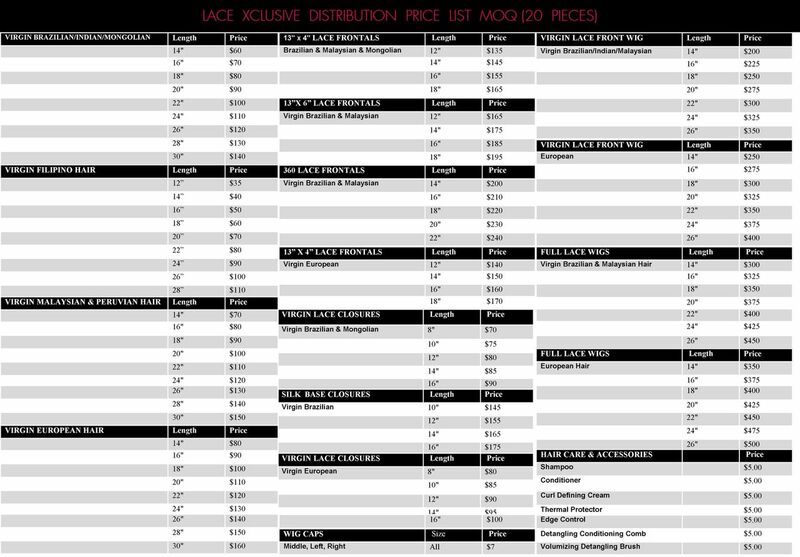 With a yearly membership fee of $100, you will be enlisted and advertised as an authorized dealer and official carrier of Lace Xclusive products on all our social media outlets and our website. With such publicity in place, you are sure to make fantastic sales in your local area, while selling at distributor prices. Now that you have all requirements, placing orders cannot be any easier! Please note that there is a required Minimal Order Quantity (MOQ) of 20 units per style with each purchase, and orders can include any number of styles from our fabulous line of products. Members will be responsible for shipping and handling from our warehouse to your preferred location, alongside local taxes in your state. The turn-around time is 20-25 days from the date of purchase until you received your ordered products. The products must remain in Lace Xclusive signature packaging which must not be altered in any way. Members must not add their company stickers or print their name or logo on the packaging. Products gotten through the Authorized Distribution Program must not be sold at a lesser rate than what is on the Lave Xclusive website. Members must not claim the production or sponsorship of these products in any of their public relation outlets. Lace Xclusive must always be referenced or tagged in adverts for verification of authenticity of products, both on websites and social media. Members must submit all their company's and affiliate social media handles to Lace Xclusive. Members who fail to adhere to these guidelines will lose their membership and ability to purchase our products in the future. Also, note that membership optional authorized distributor fees or advertising fees are NON-REFUNDABLE. Ready to become an Authorized Distributor? Please send us a message via distribution@lacexclusive.com and request a distribution form which will provide basic information about your company.